A photo copyright release grants permission to a third party to reproduce (reprint) photos taken by the photographer who owns the copyright. This release of liability may typically be required by a photo store or lab before they will make copies of wedding photographs, event photos etc. The moment it seems that the photographs were captured by a professional, you may find a reluctance to make reproductions of photos, lest a lab find themselves at the receiving end of a copyright infringement claim. The photographer does not release copyright in the photos and the heading on the form should read 'Photo Print Release'. However, many photo reprint businesses demand a copyright release form even though it uses the wrong terminology (strictly speaking). Please change the heading on the form if that is what you require in order to get the job done. So to reiterate! The photographer retains ownership of the copyright, but licenses or authorizes the client - and thereby the photo lab - the right to copy the photographs. The validity of this document can be verified by contacting the photographer. The form above may be suitable for reproductions done for personal use e.g. albums, canvases, DVD covers etc. for themselves and their family. When it comes to commercial use such as brochures, calendars, websites, newsletters etc, you may want to use a more detailed license agreement that will stipulate usage and payment terms. Consult with a copyright attorney for advice. 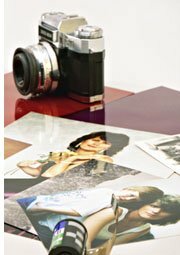 Tip for photographers: Print your photo copyright release on your business letterhead for a professional look and credibility. Adult Model Release Form - Covers still photographs as well as video with voice recording.